Recently, several brewing industry histories have hit the shelves. Each is a wealth of information and well worth the read. However, in We Make Beer: Inside the Spirit and Artistry of America’s Craft Brewers, Sean Lewis has taken a much more ambitious route: tapping into the heart and soul of the new generation of brewers and explaining the ins and outs, the passions and the trends in the growing industry like the proliferation of beer collaborations between breweries. First, a truth: I wish I’d written this book. Hell, I wish I’d published it. For structure, Lewis has taken brewing themes, such as the tension between tradition and automation, and explored them through the eyes of individual brewers. (The section on Firestone Walker is, alone, worth the price of the book.) In so doing he has come very close to explaining why the craft brewing industry has transformed and reshaped how things are done in the broader beer world. While he details the workings of individual professionals, Lewis provides an extensive education on brewing for the average consumer. He is very skillful at wrapping each story, each narrative, around a critical value or belief that permeates this exciting industry. Why do today’s brewers invest so much time and energy in promoting their own competitors? The team at Stone Brewing Co. has some thoughts. What’s with those Lancaster, PA, breweries, anyway? Lewis has some ideas. How do craft brewers balance the use of traditional methods with the advantages of modern technology? Jim Koch of Boston Beer, maker of the Samuel Adams brand, clarifies this issue. What is it that separates the great ones from the also-rans? 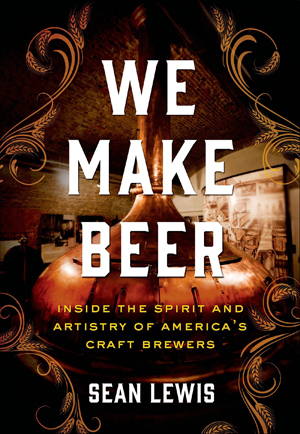 Lewis follows brewer after brewer to uncover the core values that are reflected in the work of three types of brewers. How do these brewers relate to the Internet beer gossip world? Nebraska Brewing has quite a story to tell in these pages. It’s not a big book, just a couple hundred pages, but We Make Beer punches way above its weight. It is a magnificent exploration of the deeply held values and traits that have made this industry as great as it is. If you are reading this review, in this magazine, trust me when I tell you that you are going to enjoy this book. I really enjoyed the book. Easy reading and some good stories too. Im recommending it to all my beer drinking friends and I have quite a few!